I’ve never been to a midnight movie opening. Ever. But tonight, I’m going to see Breaking Dawn Part 2 with a gal I met briefly at a friend’s opening night of a play, over a month ago. Yes, that’s right. I’m going to see a movie with a person I barely know. Why? She asked, plus she said if I’d never been to a Twilight Saga midnight show, this would be my last chance. She said it’s fun – everyone’s reactions are over the top, and you get as much a kick out of the audience as the film. 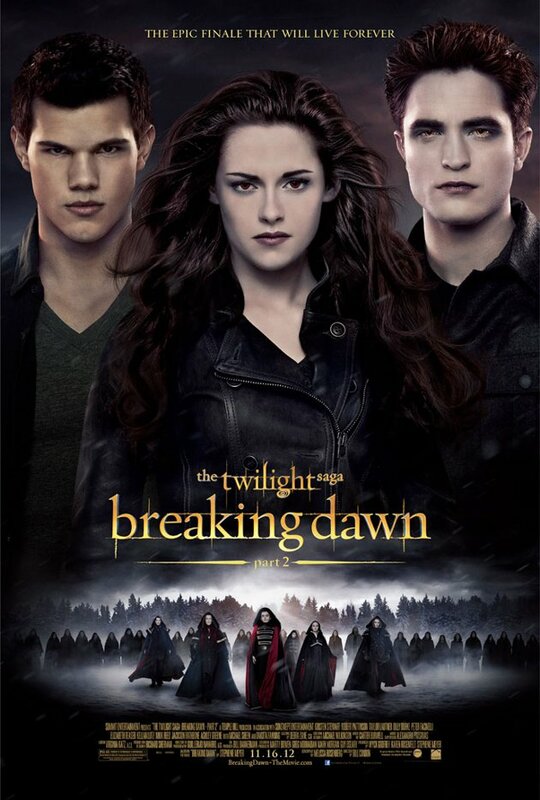 So, even though I’m going to see BD2 tomorrow night with friends, I’m also going out to the ArcLight on Sepulveda to see the 12:20am show tonight. I’ll hole up in a coffee shop prior to and write my fingers off, but then – the movie. My first time in an ArcLight – we’ve got reserved seats (no waiting in line!). My hubby told me to make sure my phone is charged, and to text him a couple of times so he knows I haven’t been abducted or anything, which I think is a hoot. But – I did recharge my phone! I will say, this is way out of my comfort zone – and I’m determined to enjoy myself. See a midnight movie, meet new friends, have new experiences – what’s not to like?! What have you done lately that’s been out of your comfort zone? This entry was posted in Life, Observations and tagged ArcLight, Breaking Dawn Part 2, Christine Ashworth, midnight movie. Bookmark the permalink. Went out to dinner at night, alone, to an address where I’ve never been before. I’m shy about knocking on a strange door, but once welcomed inside, had a lovely dinner with friends. Definitely outside my comfort zone. Thank goodness for cell phones! Let us know how your “adventure” turns out, OK? Bravo to you, Sarah! I do remember reading about that night on your blog and really admire you for going. And yes – so happy to have a cell phone in this day and age! I went to a movie alone. I’ve never done that. I had popcorn with real butter and a diet coke (because I prefer diet) and watched a movie all by myself. I’ve done so many things alone that I was kind of shocked that I’d never done that, but there you have it. Let us know how the show and the experience went. Maria, I love going to the movies by myself. No one to distract me! But I do prefer to go with someone if I have a choice. I’ve been to several movies on my own, usually in the daytime when I didn’t have a day job. A nice way to pass the time. Well…I went straight from work to the Galleria, hid myself in Starbucks and proceeded to spend three hours writing very few words (okay, close to 2k but it should have been more). Disgusted with myself, I took the laptop to the car and walked around the Galleria. And walked. Hid in Urban Home a couple of times to get warm, then walked some more. Finally I texted the gal who invited me, told her I was there “early” (it’s now 10pm) and she texts me back, saying she’s on her way. Oh, and she’s really drunk. BOY was she really drunk. It was kind of an awkward evening – dinner in Cheesecake Factory, where it’s very loud – my friend taking naps between sucking down coffee and trying to eat over medium eggs. (Apparently she went to a company event, where there was an open bar. She started drinking at 5pm. I seriously was waiting for her to vomit, she looked that out of it. Luckily, she didn’t. If I had been drinking that much? I’d have totally gotten sick.) Me not really hearing the other two gals, and half the time the three of them were hunched over their cell phones. It was kind of weird, to be honest. I was older than all of them by about 20 years. But the movie was spectacular. Listening to a full theater gasp and cry out and laugh and so forth was just wonderful and I wouldn’t have missed that for the world. I got home at 3:01am, was in bed by 3:08am and asleep by 3:11am. I’m grateful for my new friend for extending the invitation; I’m glad I went. Next time, I’ll gather a group of people I know and do it that way. Bound to be more fun!